We are looking for a brilliant, creative and motivated front-end developer who is passionate about delivering an amazing user experience. We build a product that thousands of customers already depend on. 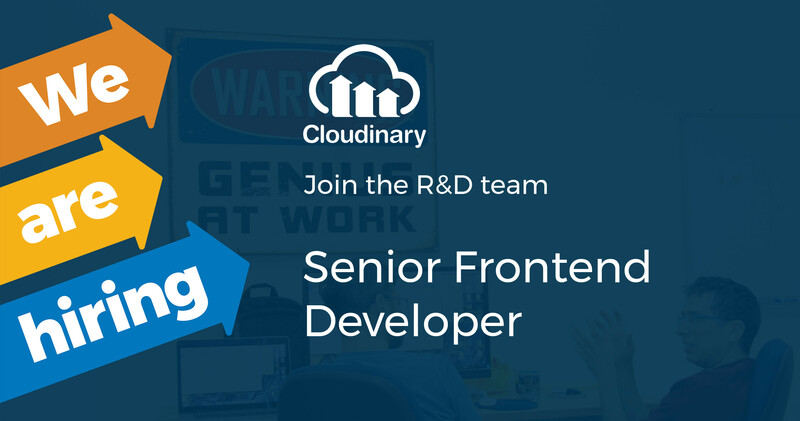 If you want to be a part of a fast paced startup, join our team as a Senior Front-end Developer. Build the next generation of Cloudinary's management console, upload and presentation widgets, and other modern web & mobile user interface components. Join a team of industry veterans and help architect and build the next version of our service. Get deeply involved with all aspects of running a successful SaaS startup. From customer focused product definition, to implementation and scalable deployment. Tackle some of the most challenging problems in online image management today. 7+ years experience of application design and development. Strong understanding and hands-on experience of web technologies and architecture with emphasis on front-end development. Deep, hands-on experience with web dev platforms (e.g., Ruby on Rails, Node.js) and modern client side frameworks (e.g., AngularJS, React). Passion for building useful and neat graphical user interfaces. Ability to carry requirements from early phase to full implementation. Great communication skills with tech and non-tech alike. Experience in Ruby on Rails development. Experience in building responsive client-side web applications (e.g., Bootstrap). Working with high scale, distributed cloud-based architectures and AWS specifically. Experience working in an early-stage startup company.